Recording at dawn on the summit of Mt Ishizuchi, 03/10/18. 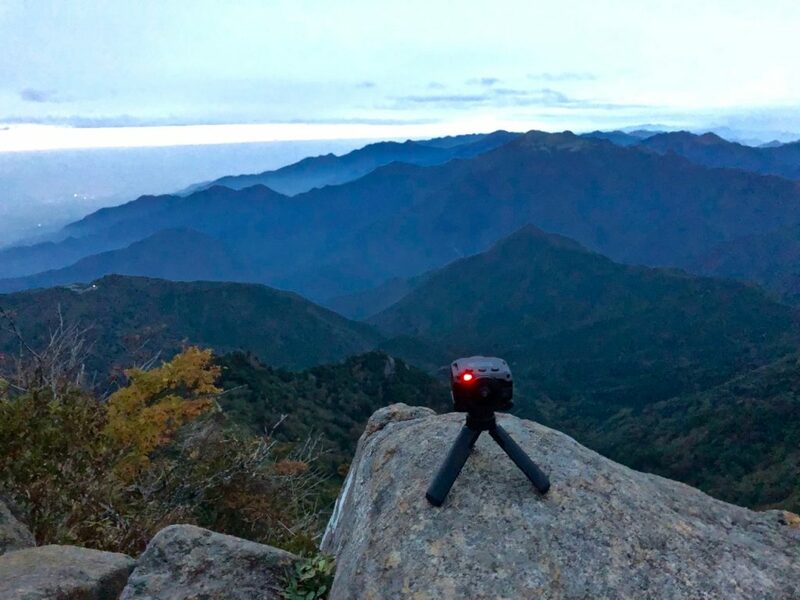 On October 3rd 2018 I climbed the series of four chain routes to reach the summit of Mt Ishizuchi in Ehime Prefecture in Japan, recording the sounds and images of my ascent with a 360 degree video camera. The panoramic images and sounds of the mountain landscape I have recorded have been used to develop a new installation which reflects my fascination with the cross-fertilization of Eastern and Western aesthetic sensibilities, both for the landscape and it’s tradition in art and for the intersection between nature and technology, which has been a major theme in my work for many years. The completed installation was premiered in March 2019 as part my solo show “The Sky is For All” at the Ruskin Gallery in Cambridge. Mt. Ishizuchi, located in Saijo City in Ehime prefecture is one of Japan’s Seven Holy Mountains and has been worshiped for around 1300 years. The Ishizuchi Shrine which holds the holy embodiment of the mountain, consists of four shrines: the main shrine at the foot of Mt. Ishizuchi, Jouju Shrine and the Tsuchigoya front shrine on the mountain side, and a shrine at the peak. The mountain is also an overall term for Mt. Tengu at 1982m which is the highest peak in western Japan, the 1974 m Mt. Misen where the peak shrine of Ishizuchi Shrine is located and Mt. Nansenpo. The entire mountain area has been made into one of the nation’s 100 Famous Mountains. From Jouju Shrine up to the mountain top is a 3-4 hour (one-way) mountain climbing route. 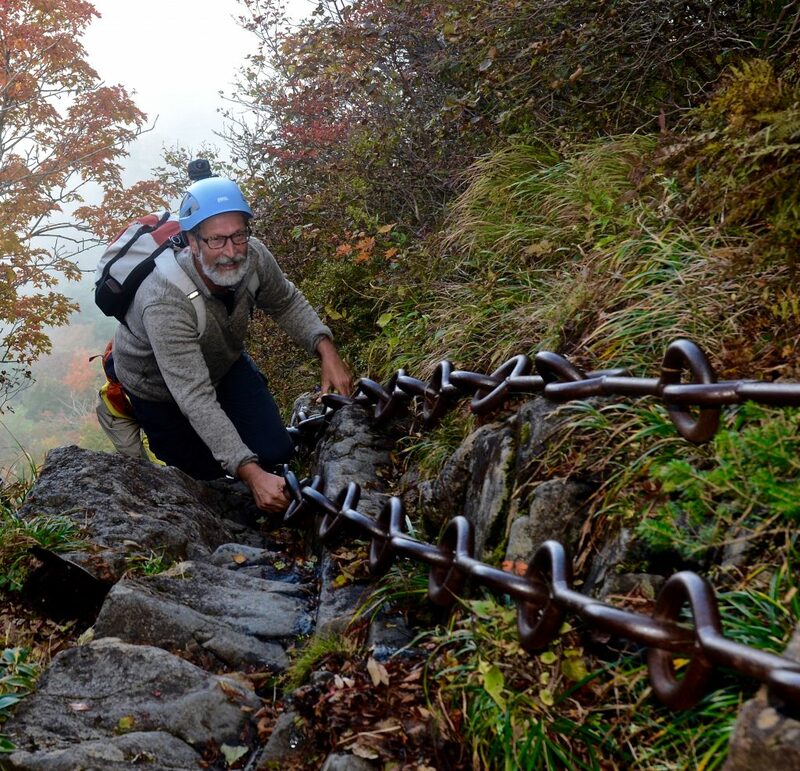 There are four heavy iron chains which can be used to climb up the perpendicular rock face. The view of Mt. Tengu which can be seen from the top of Mt. Misen is wonderful. Travelling along the narrow 200m mountain ridge, you can reach the top of Mt. Tengu which is the highest peak. Not only can one see the Seto Inland Sea and Tosa Bay, but in good weather, it is possible to view the Chugoku and Kyushu Mountains. I have been exploring the potential of panoramic imagery in my work for some time. Previous video installations that feature digital panoramic camera devices include “Interwoven Motion” (2004), “The Monument Project (Si Monumentum Requiris, Circumspice)” (2009-2011) and “In Darwin’s Garden” (2010-2013). Each of these works is concerned with different aspects of the application of panoramic technical devices and seeks to examine the possibilities of spatio-temporality in diverse ways, but for the most part from a fixed- or at least quite limited geographical location, and all have been limited to the visual aspect. “Climbing Mt Ishizuchi in the Autumn” will be the first of my landscape installations to incorporate spatial sound as an integral element, and the first to directly engage with the spiritual dimension of the landscape, specifically the Buddhist acknowledgement of the transitory nature of existence. In my approach to this new work I would also like to acknowledge or reference the Japanese tradition of Sansui-ga, (“Mountains and Water”) an approach to the art of landscape in which the human figure is just a random and transient phenomenon within the more timeless landscape, in an attempt to convey a more universal and poetic atmosphere. The video camera looks out at the world most often via a fixed stare, and in my work I have often attempted to find ways to counter this to recreate and express the dynamics of our perception. “The Monument Project” produced images of a cityscape, whilst Interwoven Motion and In Darwin’s Garden are both landscape works. This new work again returns to the subject of the landscape, but one which produces images of the landscape in relation to a direct experience of the human body. For many years the influence of the phenomenologist Maurice Merleau-Ponty, who famously observed the “artist takes his body with him” in his seminal essay “Eye and Mind”, has had an impact on my work and ideas. In this new work the camera has recorded the relationship between my body and the camera directly. The physical activity and effort of climbing the route from the Jouju shrine to the Ishizuchi shrine at the peak of the mountain is the formal basis of the work. The sounds and images of my act of pilgrimage have been documented in continuous “real-time” and formed the basis of the final work. Another central theme that continues in this new work is that of the continuously evolving relationship between human technology and the natural world. As an artist who has chosen to work and engage directly with technological devices, I seek ways to highlight both my fascination with emerging imaging technologies and my concern for the way in which these devices can alienate and distance us from an awareness of our own subtle perceptual processes and the interconnectedness and dependency with our surrounding environment. This theme is now even more urgent and timely, given that our relationship with the environment has recently shifted so dramatically and we have entered firmly and tragically into the so-called “anthropocene”.